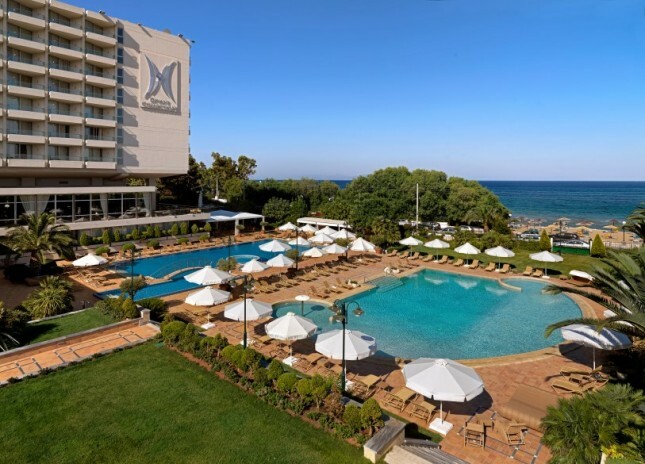 For a memorable stay when you’re visiting Athens, the Divani Apollon Palace & Thalasso offers a new level of luxury. Based in the heart of the Athenian Riviera, this five-star accommodation boasts lavish guest rooms and suites all with stunning sea views, a private beach, outdoor swimming pools, restaurants and bars, and extensive business and events facilities. The most unique aspect of the hotel, however, is that it offers you the only Thalassotherapy centre in the Attica region. Spanning 270 square metres, the spa is home to the biggest Thalassotherapy pool in Greece, with 16 different areas with water jets where guests can relax and unwind. In addition, guests have access to a full range of spa facilities, as well relaxing and refreshing treatments. Some of the most popular include purifying rituals, Thalgo oxygen facial treatments, the Apollo massage and the pampering body massage. You can also take part in a range of wellbeing programmes and take advantage of the state-of-the-art gym facilities and on-site hairdresser. The rooms and suites are of the same standard as the stunning spa and Thalassotherapy centre. Overlooking the ocean, the views are outstanding. They also offer all the amenities and luxuries you could want during your stay. There are two outdoor swimming pools with fresh and saltwater, as well as jacuzzis, sunloungers and love seats surrounding these. Lie back and relax with a signature cocktail or fresh juice from the bar, and soak up the rays. To really enjoy those extra luxuries that make your holiday perfect, this is the perfect accommodation to book.